Probably not more then most people but enough to know what is good TV and bad TV. This is why I get upset when I see not just good TV go off the air but GREAT TV. The Washington Post has an interesting story on the filming of the final episode of HBO police drama THE WIRE. Created by some of the same people as HOMICIDE: Life on the street (another incredible show) this show was probably the truest portrayal (not that I would know firsthand) of urban city Police work…….good and the bad….and while season two was a bit of a “miss” for me personally I still think this show was brilliant and deserved a wider audience. ….anyone curious where this “Wire” art is from? 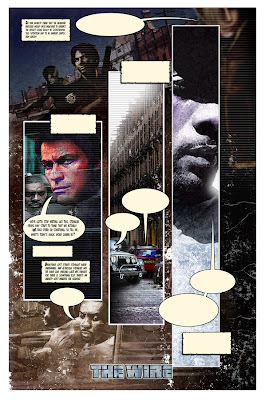 Well several years back I worked with HBO to bring the Wire to comics. Stuff happened and no one saw it except a handful of folks but like the show, the comic would’ve been incredible!